I've never seen the previous Vacation movies - this one is considered a follow-up of sorts - but I've heard they were "classic" comedies and worth seeing. I'm not sure if this year's Vacation is worthy of that distinction, but parts throughout were definitely amusing and made me laugh. 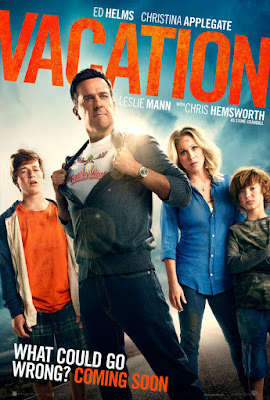 Rusty Griswold (Ed Helms) looks forward to taking his family to their cottage in northern Michigan every year, but he's noticed that his wife (Christina Applegate) and kids (Skyler Gisondo and Steele Stebbins) have begun to show a lack of enthusiasm for the trip. He decides to change things up this year, and they set out for a road trip to Walley World, an amusement park where he and his parents went when he was a child. They encounter a series of misfortunes along the way, but are also able to visit his sister (Leslie Mann) and brother-in-law (Chris Hemsworth) in Texas, as well as his parents (Chevy Chase and Beverly D'Angelo, from the original films) too. Chris Hemsworth actually stole the show in this film, as a very Republican Texan who is married to Rusty's sister, Audrey (Leslie Mann). What made his turn in the movie so funny is that only a little bit of it was shown in the trailer for the movie; a lot of the other gags that come up I already knew about from the trailer, so they weren't as funny the second time around. Helms is also fine here, although I read somewhere that he almost was acting as "a parody of himself," which I would agree with. There are also (spoiler?) a few cameos that I wasn't expecting, and if you recognize the actors there, those should come as a surprise too. Maybe see this film. If you're a fan of the original Vacation movie or you really like slapstick/silly humor, you might enjoy this one. Overall, it wasn't a bad film - I was never bored during it - but it's not one I would pay full-price to see; you can save it for a matinee or for Blu-ray/DVD. A lot of the humor in the film is a bit raunchy/not PC, but the film is rated R so that's par for the course, in my opinion. It will be interesting to see if nostalgia wins out at the box office and this movie does well, or if its reputation (and inevitable Rotten Tomatoes ratings; critics tend to be harsh on comedies) prevent moviegoers from wanting to see it. Vacation is in theaters today, July 29th, and is rated R with a runtime of 99 minutes. 3 stars out of 5.